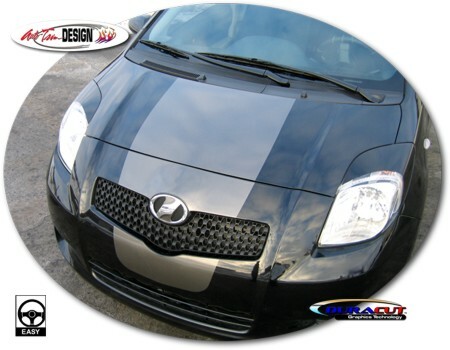 Set your '07-Current Toyota Yaris / Vitz Liftback apart from the rest with this unique Rally Stripe bumper, hood, roof and liftback rear graphic kit. This easy-to-install kit is packaged as a set of six (6) pieces. They're PRECUT and ready to install in a wide variety of colors - NO TRIMMING required! This stripe package is not just a set of 9" (22.86cm) straight strips in a box. Our graphic kit consists of prefitted and contoured pieces as shown in the illustration. Kit is specifically made for the '07-Current Toyota Yaris / Vitz Liftback factory bumper, hood, roof and liftback rear areas and will not fit any other vehicle. 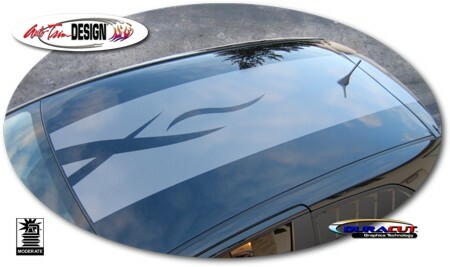 Rally stripes are set to install 3.5" (88.90mm) from center of vehicle at time of installation. 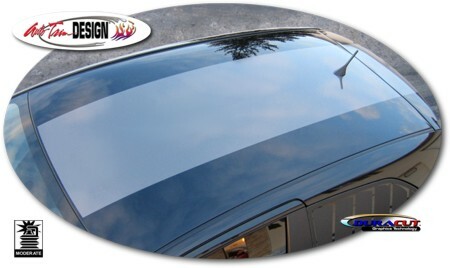 Optional Trimmable Spoiler Kit (ATD-TYTAYRSGRPH4) includes one (1) 7.85" x 11.703" (19.94cm x 29.73cm) piece that can be hand trimmed for Liftback spoiler applications. Please Note: While kit is shown on a two (2) door Liftback, it will fit four (4) door Liftbacks as well.